There are a ton of businesses out there that are 'making it' in today's digital landscape. They have a decent online presence, a small library of content, and are well on their way towards digital marketing success. But they're not entirely sure what to do next. Often times that success brings an understanding of what they're not doing. Sometimes clients have the makings of a strong digital marketing campaign, and only need a push from a strategic partner to get to where they want to go. This was the case with Handbid and Revenue River's relationship. Handbid is a company that helps non-profits and charitable organizations raise money for their cause. Often times, fundraising events have a silent auction that contributes to the overall fundraising efforts of that organization. Handbid helps these event managers plan out and host their auction to engage with bidders and drive additional donations. Through their iOS and Android-friendly app, it's much easier to collect donations, create and manage your auction, and manage ticket sales. Before 2018, Handbid took a shotgun approach to their digital marketing strategy. They were doing all the right things: creating valuable content, best practice emails and marketing workflows, and posting regularly to engage with their audiences on social media. Their marketing activity indicated that they had the makings of a strong digital marketing campaign. They just needed a push to get started. Handbid didn't have the expert guidance they needed to maximize their results. Their marketing and sales teams were more siloed than aligned - getting them aligned properly was our primary focus. The next step was for us to identify and implement a conversion path that provided enough contact information for sales to qualify or disqualify leads while also providing a positive user-experience for Handbid's traffic. After that, we wanted to take took a more strategic approach for Handbid's content. We needed to help Handbid write articles based on long-tail keywords that actually get searched. Ultimately, Handbid reached out to Revenue River to better their already successful marketing and sales systems. They wanted to enhance their conversion rates to generate more leads per month, while better aligning sales and marketing. Read about the complex system integration project we pulled off for Deuter. First and foremost, we enhanced Handbid's simple forms to be more relevant to where their site's visitors are in their purchasing decision. We wanted to help qualified prospects distinguish themselves from simple leads while ensuring that our strategy could be used in future months. As you can see, we didn't change much of the content on this page. This new form asks for two things: more information overall and specific information relevant to the sales cycle. Including this essential information on the front end allows Handbid's sales team to have all the information they need to further qualify and prepare leads for the hand-off. After making these changes to Handbid's BOFU landing page, we've seen a 146% increase in new contacts generated. This strategy falls nicely within Revenue River's recommended changes to Handbids sales qualification processes, which is detailed in the next section. Handbid's old sales system was good, but it wasn't great. This is because Handbid's salespeople were tasked with managing leads from their initial conversion on Handbid's website to their eventual purchase of the mobile bidding technology. We found that the distribution of roles and expectations was causing these salespeople to be spread thin. But it's not their fault. Originally, these salespeople were tasked with prospecting, qualifying leads, closing the deal, and fulfillment. That's a lot! We pivoted from this old system to one that helped them work smarter, not harder. It's important to understand that we didn't revolutionize their sales system. Rather, we optimized and consolidated aspects of their sales follow-up activity. This paradigm shift helped to clarify exactly when a lead was considered 'qualified' and ready for sales follow-up. We empowered one member on their sales team to own the qualifying process and to loop in the next salesperson at the right time. He would be responsible for initially communicating with the prospect and, when the prospect was determined to be qualified, handing off the prospect to another salesperson to close and fulfill. This marriage of Handbid's salespeople with an updated sales process has been successful. We know this because the salespeople are confident that the prospect is qualified, and are more willing to engage with that prospect to determine their needs. This revised sales process has generated 30% more customers per month in 2018 than in 2017. In 2017, Handbid generated 117 total customers. In the first half of 2018, we've generated 73 customers, and are on track to break a Handbid record. Content marketers have a tough job to be 'industry experts' in a world where they're most likely not the expert. This was the case with Handbid. Handbid has been helping non-profits, charities, and other organizations drive more engagement and profits from their silent auction for nearly a decade. This means that they're strategically poised to create high-quality content about mobile bidding and fundraising events. It also means that it is much more of a content partnership, in that Revenue River puts together topics and succinct outlines that Handbid then turns into valuable blog posts. Through Handbid's creative firepower and Revenue River's strategic direction, we've improved the overall content creation process. Their content is always created with SEO best practices in mind, they have started to collaborate with guest authors, and they've started to update old articles according to historical blog optimization best practices. We started by developing a best practice pillar page, complete with cluster blog articles based on high search volume keywords. These cluster articles aim to answer key questions that Handbid's target audience has about silent auctions and mobile bidding. 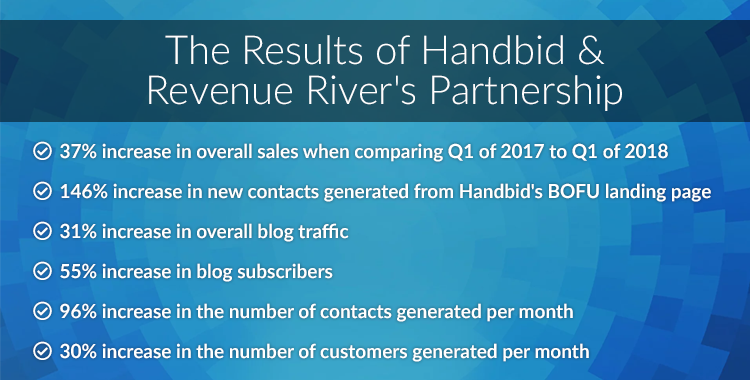 Through Handbid and Revenue River's partnership, we've seen noticeable growth in blog visits and subscribers. Check out the screenshots below to see blog analytics from January through June of 2018, compared to July through December of 2017. We've seen a 31% increase in blog traffic, and a 55% increase in blog subscribers in that time. What's the Future for Handbid & Revenue River? We're incredibly proud of the success that Handbid has seen in their digital campaigns. 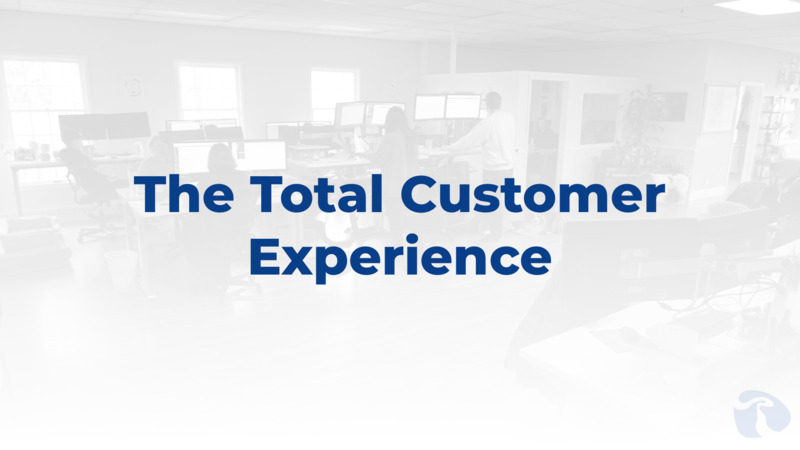 In a few short months, we've been able to exceed last year's new customer generation numbers, as well as significantly improve blog traffic, subscribers, and more. A Blog Redesign to allow readers to easily sort through and find what they're looking for in Handbid's library of valuable content. Their current blog design isn't lacking any mission-critical elements, but it could be converted into a more user-friendly format to include conversion points on Handbid's eBooks and landing pages, to inspire readers to make comments, and to further position Handbid as the premier mobile bidding tool on the market. Creating More Videos and Multimedia to engage, entertain, and better display information. Videos and multimedia can keep Handbid's target audience on their pages much longer than simple text can. Strategically creating educational GIFs, videos, and other pieces of media are tried-and-true methods to increase on-site SEO metrics. And, of course, these content pieces perform much better when shared on social media. The first is to further improve sales follow up and accountability via workflows that prompt lead response, lead engagement, and re-engagement. These same workflows also function as helpful alerts for senior sales leadership to ensure sales engagement maintains Handbid's standards. The second initiative is to utilize custom development work to improve HubSpot's Deal Record functionality. This will move administrative and fulfillment tasks out of their fulfillment software into HubSpot's CRM by allowing the two systems to communicate with each other. 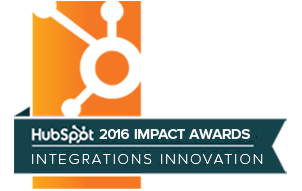 The end result enables HubSpot to leverage new properties for enhanced automation functionality. Revenue River not only helps us get the most of HubSpot, but they work with me to do the things that matter the most for my company. They're great to collaborate with, they work their butts off, and they're always willing to hop on something urgent if it's needed. I have been able to trust that we're on the same team and really look forward to seeing what's in store for the future of our partnership. We're fortunate enough to work with some incredible clients, and Handbid is one of our favorites. Starting from their humble beginnings, they've been able to take their passion for helping charities raise money through silent auctions and have turned it into a successful business. 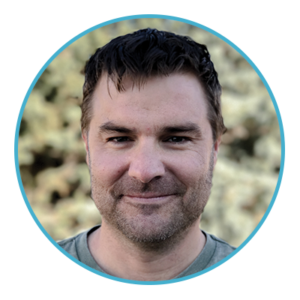 In fact, they're one of Colorado's Companies to Watch for 2018! Whether you're looking for that strategic partnership that allows your digital campaigns to soar to new heights, or to expand your system's capabilities through key integrations and tools, reach out to Revenue River by clicking on the inquire button below. Put our agency to work towards solving your challenges and reaching your goals. Serve your customers the way they expected to be served in the digital age.